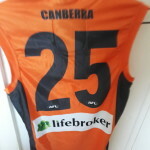 Commemorative Football Guernseys, Jerseys, Jumpers are used by the AFL Football Clubs to mark a special event. This could include their participation in an historical event such as the Anzac Day Game or involvement in a Mothers Day Match or Indigenous Round Matches. Other significant occasions may be Club Anniversaries to mark the length of time a club has been in the AFL League. 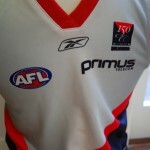 One such significant anniversary Football Guernsey, Jersey, Jumper is the AFL Melbourne Demons 150 years Guernsey. 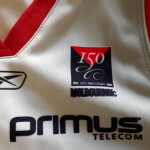 It is unusually coloured in silver red and navy with the special logo of 150 years 1858 - 2008 on front . 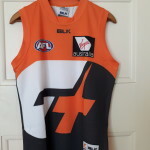 Over time these AFL Football Guernseys, Jerseys, Jumpers have become harder to source and loyal fans regard them as a true collectors item. 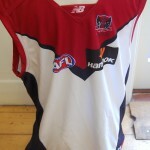 The ardent AFL Football Fan will often own a series of these AFL Football Guernseys, Jerseys, Jumpers which are a visceral history of their Clubs significant matches and participation in milestone events. AFL Football Teams, the Collingwood Magpies, and the West Coast Eagles will play off in the 2018 AFL Grand Final. The Brownlow Medal presentation was held in Melbourne last night, as is the custom for it to be presented to the years best and fairest player, before the Grand Final. Hawthorn star Tom Mitchell has won the 2018 Brownlow Medal, beating Collingwood's Steele Sidebottom. The ceremony, held at Crown Casino, saw the wives and girlfriends of players, affectionately known as WAGS, sashaying down the red carpet very elaborately dressed in designer couture. There were no AFL football jumpers, jerseys, guernseys, in sight. The partners of AFL footballers have limited opportunity to participate in AFL functions so this very social night. It is a good opportunity for them to meet and greet and show off their frocks. 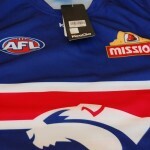 A novel idea could be for them to dress in an amalgamation of discarded football jumpers, jerseys, guernseys? Rebecca Judd, Tanya Buckley and Nadia Bartel were among many who dressed up and commentated at the glittering event. Excitement builds in both Victoria and Western Australia as the 2018 Grand Final approaches. The Grand Final Parade this Friday, the 28 September, the day before the Grand Final, promises to draw a big crowd. 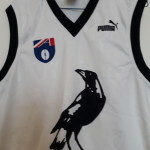 The Collingwood fans will be in attendance wearing their black and white football jumpers, jerseys, guernseys. 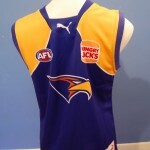 Many West Coast Eagles fans will fly in from Perth to watch their team play. 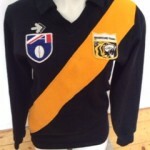 They too will be packing their yellow and blue football jumpers, jerseys, guernseys. The two Sydney teams the Swans and the Giants played off in an elimination final on 8 September at Sydney Cricket Ground. The Giants started strongly and overwhelmed the Swans early in the match. Playing fast, powerful footy the Giants were the victors, ultimately outplaying the Swans and thrilling fans with an exciting brand of footy in a fast paced, action packed game. The Swans are now out of the 2018 AFL Football Finals Series. The Giants will continue to play on. 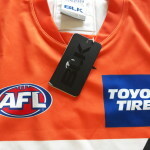 Fans will be attending the games wearing their distinctive orange, grey and white football jumpers, jerseys, guernseys. The 2018 AFL Final Series has begun. Hawthorn were outplayed by the Richmond Tigers on Thursday night in the first Elimination Final . The Tigers appear on track to win another Grand Final. Fans were treated to a thrilling game in front of a capacity crowd at a packed MCG. Last night the Melbourne Demons turned on a powerful display of power footy to beat a hapless Geelong Cats team. 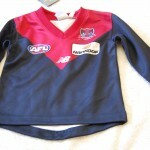 Jubilant fans and players were ignited with passion as the Demons faithful, wearing their football jumpers, jerseys, guernseys ,watched with delight as their team seized victory. Today it is the turn of the Magpies to challenge an in form West Coast Eagles side over in Perth . Collingwood have travelled but are confident of victory against the Eagles . The second elimination final is between the Swans and Giants being played in Sydney. Will they get a sell out crowd? In a city that predominantly follows NRL it will be an interesting marketing exercise for the AFL. Local loyal fans will be at the game wearing their AFL footy jumpers, jerseys, guernseys barracking loudly and hoping their team will be the winner. Exciting times on and off the field and fans, spectators, commentators and the general public are loving the action. Teams not in the finals are rebuilding, letting players go, trading or watching older players retire. September is finals month in the AFL and already it is providing quite a spectacle. The end of the 2018 home and away fixture of AFL matches saw mixed results . The reigning premiers the Tigers had a small victory over the feisty Bulldogs, the Hawks beat the Swans in a close game, Collingwood just beat Fremantle, and the Demons thrashed Greater Western Sydney. The finals Season begins on Thursday night at Melbourne's MCG when the Tigers play the Hawks in what should be a thrilling battle. 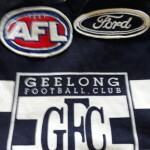 In another epic struggle Geelong play Melbourne on Friday night at the MCG in a mighty elimination final. Melbourne who haven't played finals footy for some time will be hoping to play through to the next round of finals matches. Geelong always a tenacious opponent will be hard to beat. Ticketek, the main seller of finals tickets became embroiled in controversy after their site failed to function and fans were unable to purchase tickets on Tuesday morning as advertised. Sales have now been pushed back to Wednesday . Fans will be along at all the games wearing their football jumpers, jerseys, guernseys hoping their team will have a successful 2018 Finals Campaign.